If you’ve been on social media then perhaps you’ve seen the “Ancient Aliens” meme; a wild-haired alien aficionado Giorgio A. Tsoukalos attributing all manner of things to aliens. 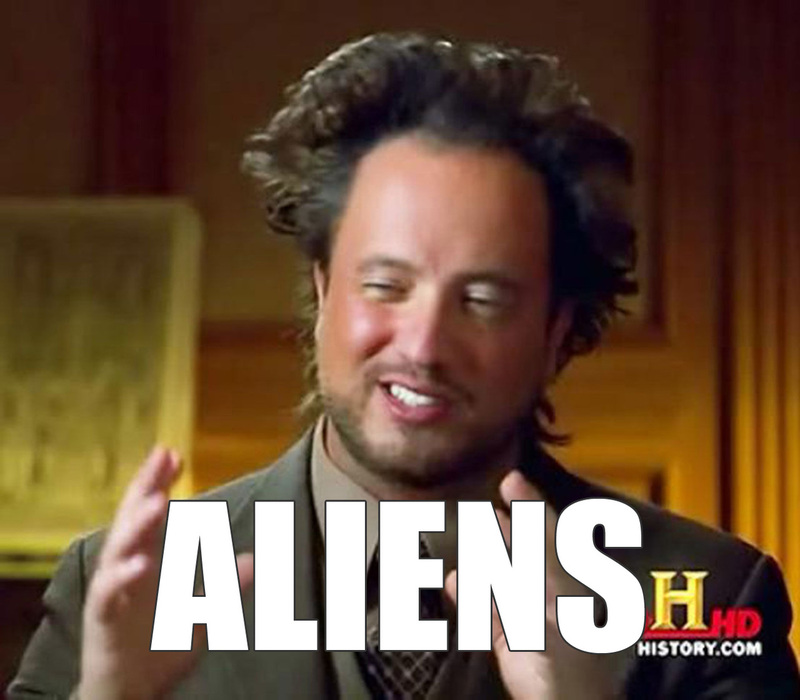 Attributing the pyramids to aliens is absurd. But taking something very real and being completely wrong about its cause is all too common, particularly in media reporting. Unfortunately, these attribution errors are often taken more seriously than Tsoukalos’ aliens. Fortunately, scientists have some strategies in their arsenal for avoiding such attribution errors. And you don’t require a PhD and research lab to use the strategies. The search for missing Malaysian Airlines MH370 has been marred by false alarms. Many of these false alarms were preventable, using techniques often employed by scientists. Some searches relied on visual inspection of satellite images, including images that have been digitally altered in the hope of identifying relatively small pieces of debris. While some searchers were cautious, predictable false alarms arose. Many debris sightings were linked with MH370, when in all likelihood they had nothing to do with the missing jet. There’s a lot of fish in the sea, and a lot of rubbish too. Further, people using digitally enhanced images may have misidentified image artefacts as debris. The false alarms could have been reduced using control samples (some searches may have used control samples, but this has gone largely unreported). For example, if satellite images from inside and outside the search area were inspected, one could estimate the number of debris sightings not associated with MH370. In a sense, this happened inadvertently when initial searches unfortunately focused on the South China Sea instead of the Indian Ocean. Searching for known objects may have also reduced the false alarms. For example, there are claims online that MH370’s contrails are visible in satellite images. If this were true, satellite images should also show contrails from other jets with known flight paths crossing the Indian Ocean on the same day. This cross check (among others) is largely absent from online discussions of MH370. Many UFO snapshots are patterns of light created by lens flares and reflections off windows. These artefacts are well known to astronomers, professional photographers and film director J.J. Abrams, but are perhaps unfamiliar to some tabloid journalists. Scientists often gain understanding, including correctly interpreting data, by collaborating with relevant experts. And such collaborations shouldn’t be limited to scientists. Last year I was emailed by someone who witnessed a star brighten and then rapidly disappear. Fortunately she recorded the time and location of the event, and I recognised it was an “iridium flare” produced by an orbiting satellite. Someone unfamiliar with iridium flares could believe they saw a UFO or an exploding star, but collaboration demystified the initially strange and inexplicable. Many Daily Express’ alien stories discuss rather elaborate theories about the mundane. A Mars rock that looks a bit like a person (or just about anything) is evidence for aliens. Shadows on the moon aren’t just lumps and bumps on the lunar surface, but evidence for a giant insect. Nope. There may well be aliens somewhere in the universe, but if you are looking at a rocky planetary landscape, you are probably looking at rocks and shadows, not aliens. Mundane explanations aren’t just for debunking tabloid UFO stories. In 2011, the OPERA experiment hinted that neutrinos could travel faster than light. However, even the OPERA scientists were cautious about this result, given it was at odds with Einstein’s theory of relativity. A scientific theory like relativity is more than just an idea; it is a “comprehensive explanation of some aspect of nature that is supported by a vast body of evidence”. Established theories can be powerful tools for determining if a claim is likely to be true. In the case of the speeding neutrinos, a dodgy connection in the experiment was found to be producing erroneously fast measurements. The mundane trumped the headlines. “Correlation is not causation” is a great victory of science communication. Millions now know that two sets of data can line up very nicely just by random chance. The Spurious Correlations website has many excellent examples of meaningless correlations. I particularly like the correlation between deaths caused entanglement in bed sheets with revenue from skiing facilities. This is all fine and well, but how do you tell meaningful correlations from the spurious correlations? Indeed, pseudo scientists will invoke “correlation is not causation” to dismiss vaccines or climate science. The answer is science doesn’t stop at simple comparisons of data on plots. For example, the rise in global temperatures is correlated with the rise in atmospheric CO₂. But the science doesn’t end there. One can look at temperature rise as a function of location, altitude and time of day. Theory predicts more CO₂ increases the absorption of infrared light, thermal expansion of the warming oceans contributes to sea level rise, and natural impacts on climate aren’t ignored. Science is more than a plot correlating two sets of data. When it comes to pseudoscience, the analysis often stops with the simple plots. Online I’ve argued with the climate “sceptic” blogger Joanne Codling about her climate claims, which have been publicised by Miranda Devine in the Daily Telegraph. Curiously Codling and her husband have a graph that suggests nuclear tests had a bigger impact on global temperatures than volcanoes. They’ve speculated dust was responsible, but they didn’t seek additional evidence. Even a cursory look at measurements of atmospheric particulates shows volcanoes injected far more dust into the air than nuclear tests. Volcanoes had a greater impact on climate than nuclear tests, correlation isn’t causation, and science is more than lining up data on graphs. We live in a data-rich world. We can upload camera phone images in an instant, or download data and examine it with a spread sheet. Understanding the origins of what we see is harder. But with a little bit of scientific method we can all avoid the worst attribution errors.